Belousov A. B. 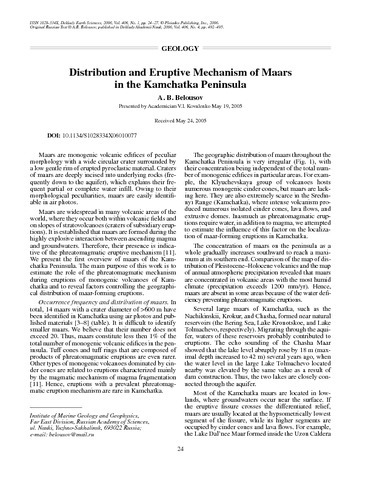 Distribution and eruptive mechanism of maars in the Kamchatka Peninsula // Doklady Earth Sciences. 2006. V. 406. № 1. 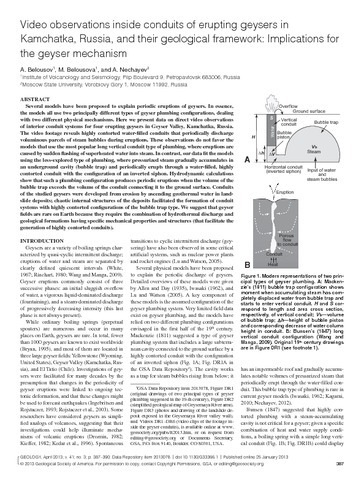 P. 24-27. doi:10.1134/S1028334X06010077. 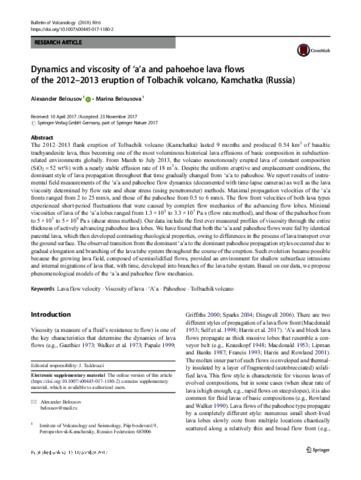 Belousov A., Belousova M. Dynamics and viscosity of 'a'a and pahoehoe lava flows of the 2012-13 eruption of Tolbachik volcano, Kamchatka, Russia // Bulletin of Volcanology. 2018. V. 80. № 6. 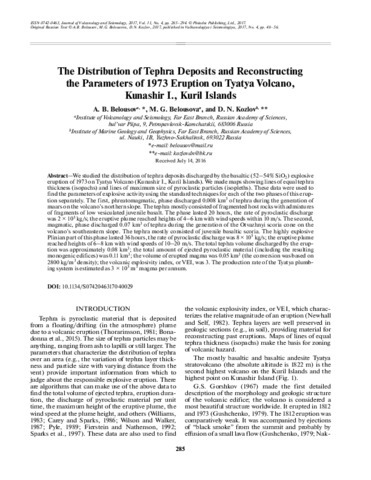 Belousov A., Belousova M., Kozlov D. The distribution of tephra deposits and reconstructing the parameters of 1973 eruption on Tyatya volcano, Kunashir, Kurile Islands // Journal of Volcanology and Seismology. 2017. V. 11. № 4. P. 285-294. Belousov A., Belousova M., Nechayev A. Video observations inside conduits of erupting geysers in Kamchatka, Russia, and their geological framework: Implications for the geyser mechanism // Geology. 2013. V. 41. № 4. P. 387-390. doi:10.1130/G33366.1. 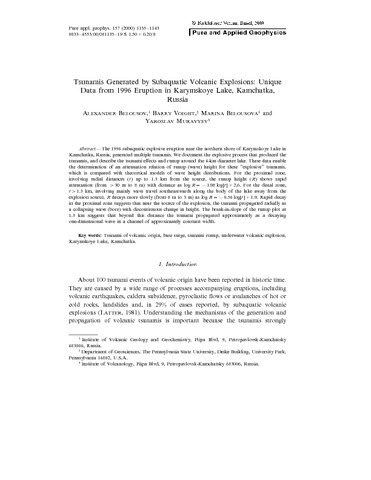 Belousov A., Belousova M., Voight B. Tsunamis Generated by Subaquatic Volcanic Explosions: Unique Data from 1996 Eruption in Karymskoye Lake, Kamchatka, Russia // Pure and Applied Geophysics. 2000. V. 157. № 6-8. P. 1135-1143. doi:10.1007/s000240050021. Belousov A.B. 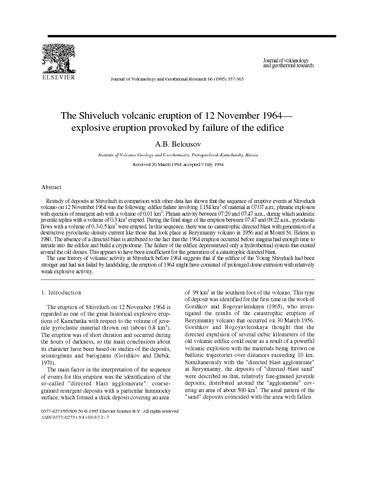 The Shiveluch volcanic eruption of 12 November 1964 — explosive eruption provoked by failure of the edifice // Journal of Volcanology and Geothermal Research. 1995. V. 66. № 1-4. P. 357-365. doi:10.1016/0377-0273(94)00072-O. 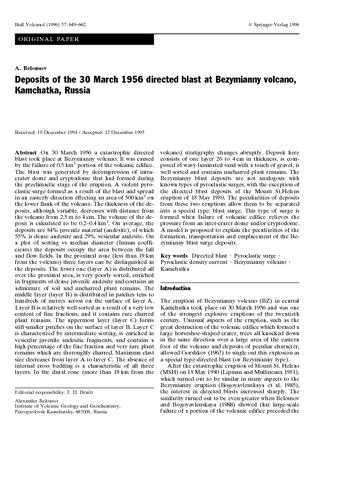 Belousov Alexander Deposits of the 30 March 1956 directed blast at Bezymianny volcano, Kamchatka, Russia // Bulletin of Volcanology. 1996. V. 57. № 8. P. 649-662. doi:10.1007/s004450050118. 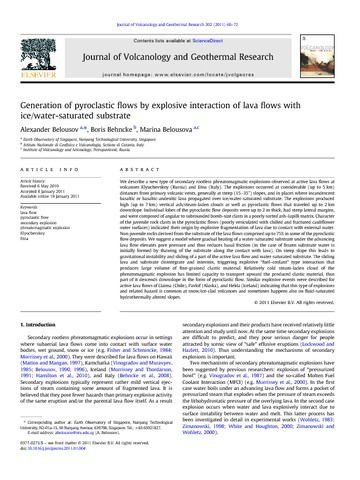 Belousov Alexander, Behncke Boris, Belousova Marina Generation of pyroclastic flows by explosive interaction of lava flows with ice/water-saturated substrate // Journal of Volcanology and Geothermal Research. 2011. V. 202. № 1-2. P. 60-72. doi:10.1016/j.jvolgeores.2011.01.004. 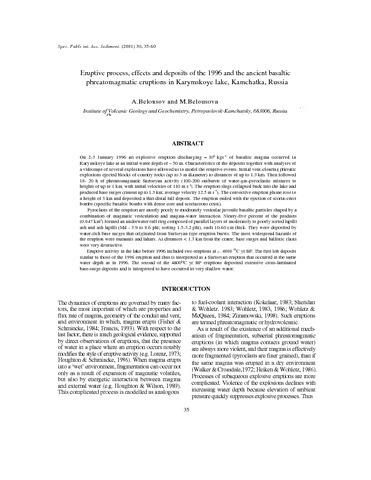 Belousov Alexander, Belousova Marina Eruptive process, effects and deposits of the 1996 and the ancient basaltic phreatomagmatic eruptions in Karymskoye lake, Kamchatka, Russia // Volcaniclastic Sedimentation in Lacustrine Settings. 2001. P. 35-60. № 10.1002/9781444304251.ch3. Belousov Alexander, Belousova Marina Formation of partially submerged tuff ring during the 1996 sublacustrine surtseyan eruption in Karymskoye lake, Kamchatka,Russia // Terra Nostra. 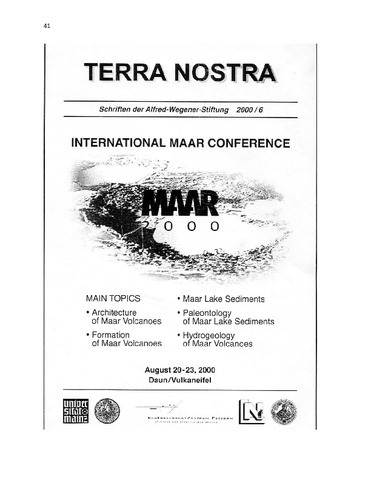 International Maar Conference: GeoForschungs Zentrum Potsdam. 2000. V. 6. P. 42-52.